Are you a diehard fan of Law & Order or True Detective? Do you read SCOTUSblog? Do you follow local, regional, or national politics? 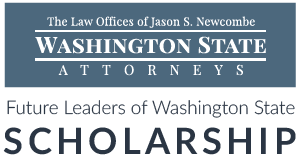 If you are interested in the legal field or a related field-such as government, politics, criminal justice, or finance-and are a high school or college student, apply today for the $1,000 Law Offices of Jason S. Newcombe Future Leaders of Washington State Scholarship. At The Law Offices of Jason S. Newcombe, our firm’s attorneys are proud to help people in a variety of different areas of law including divorce, DUI defense, bankruptcy, and personal injury. We want to share our passion and enthusiasm for what we do with a new generation, so we are offering one $1,000 scholarship to help a student interested in the legal field (or a related field) further his or her dreams. This scholarship is open to any high school or college student. He or she simply must be enrolled at a two-year or four-year institute for the upcoming school year. A minimum GPA is not required. To apply, create a short (30-120 second) video about why you are interested in law, what your dreams and goals are, and how this scholarship will help you achieve your goals. Upload your video to YouTube, then share it. Fill out the application and include a link to your video on YouTube. The winner will be chosen based on the content and creativity of his or her video. The number of likes that the video receives will also be taken into consideration, so make sure to share it! For detailed instructions on how to apply, read our scholarship instructions. Applications are due February 28, 2015. The winner will be announced April 2, 2015. Ready to get started? Enter your email below to begin the application process. Please read our scholarship Terms and Conditions before proceeding. Call GNGF at 513-444-2016 or email scholarship@gngf.com.